The relic of St Padre Pio. Image: Giovanni Portelli. “The parishioners are elated to have this relic, they have been waiting for this” Fr Suresh said. The diverse crowd was made up of Glenmore Park parishioners and people from right across Sydney, who have a devotion to St Padre Pio. “It’s good so many people came from outside the parish, there’s a big crowd of people,” Preston, a parishioner from Glenmore Park, said. With the parish church bells ringing, a procession began at 9.30am in the neighbouring Bethany school hall. This was followed by the Feast Day Mass, which was standing room only, led by principal celebrant Fr Suresh Kumar. There was also a veneration and blessing by St Padre Pio’s holy relic to the pilgrims who attended Mass. The pilgrims also received the Plenary Indulgence from the Diocese of Parramatta upon completion of the requirements – receiving the Sacrament of Reconciliation, receiving Holy Communion and praying for the intentions of the Holy Father. “Today’s exceptional! It’s exceptional to see people go to such lengths to show their faith, their devotion and tradition. It brings the families together,” Joe, a parishioner from Glenmore Park, said. St Padre Pio Feast Day Celebrations. Image: Giovanni Portelli. The feast day was preceded by prayer and activity for St Padre Pio parish, with a Triduum held on the preceding Thursday, Friday and Saturday. This consisted of daily Mass, and a Novena to St Padre Pio. “Everyone contributed to this event, from food, to liturgy, to cleaning the hall. They all came together like a single family of God,” Fr Suresh said. Reflecting on the importance of the day and the relic, Fr Suresh was pointed out the life of St Padre Pio serves as a model of hope for the parish and clergy. “Here [St Padre Pio] is a priest who is revered by everyone for being holy. We are fortunate to have him as the parish patron. “St Padre Pio comes across as a hope for the priesthood. He is calling every priest for a life of commitment and service. “He offered his wounds and suffering for the salvation of souls,” Fr Suresh said. Deborah Sands, with her husband Guy, coordinated the feast day celebrations. Deborah is a member of the parish pastoral council and has been a parishioner at the parish since 1995. 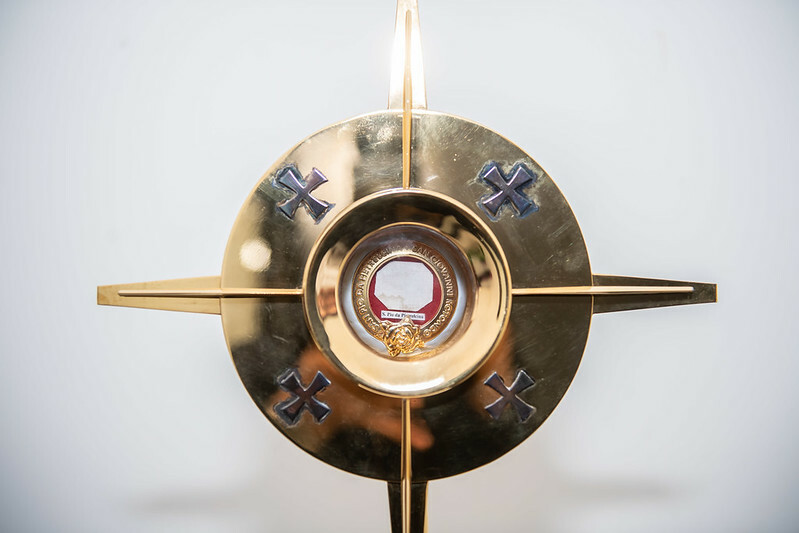 “We are absolutely blessed to have the relic, to be blessed with the relic,” Deborah said. “We have had a beautiful high Mass and hymns have made it wonderful. “Many volunteers have helped from inside the parish and many people have attended also from outside of the parish. We have sent invitations all over Sydney, Wollongong and Broken Bay. After the Mass, lunch was served through an abundance of food generously donated by the parishioners. “We have so many cultures at the parish, to have different food from the different cultures is amazing. It’s quite a big feast,” Deborah said. “We’ve always been known as the hospitable parish. “St Padre Pio is very much a man of our times, he only passed away in 1968. That’s wonderful to have that connection to a modern-day saint,” Deborah said. The relic will be available for prayer and veneration at St Padre Pio Parish, Glenmore Park every Saturday morning.